Pardon me, but you’re in my spot. About Jeffrey: Jeffrey was once a small two-eyed light-coated female cat who has matured into an enormous, one-eyed, dark-coated male. 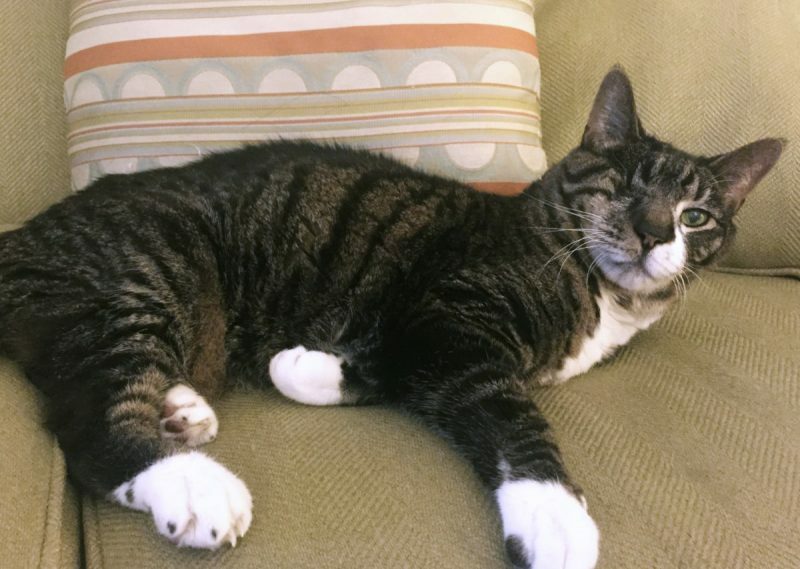 He showed up at our back door in 2003 when we lived on Capitol Hill and howled at us for days after having spent plenty of time on the mean streets. He was small and starving with a faded, coarse coat. He was so underfed, that when we scooped him up and took him to the shelter, they confirmed he was a female and named him “Serenity”. We kept tabs on Serenity, waiting for her to be adopted, but after 6 weeks of not yet being adopted, she was named “Pet of the Week.” Assuming this was the end of the road for Serenity, we decided to adopt her and bring her home to join our two other cats, Milo and Simon. When Serenity was sent to be spayed, we got a call from the vet informing us that Serenity was a neutered male, so he did not need to be spayed, but did need $400 in dental surgery! After his first (of many!) surgeries, we took him home, named him Jeffrey, and discovered he had insane food aggression issues. We had to cover the walls in plastic, because he ate by scooping all of the food up with his paws and shoving it in his mouth while simultaneously lapping out of his (and anyone else’s) bowl. Dinner took less than two minutes, but made the room look like a murder scene! Milo and Simon soon learned that dinner was a race, and that if they did not eat fast enough, Jeffrey would drag their bowl away from them. It only took him about 8 years to outgrow this. He grew surprisingly large, and was once mistaken for a small panther. He is quiet and dignified and has even been described as “regal” by the vet even though he poops in the exam room every time he sees the vet. And he sees the vet a lot. He once had to have an intestinal blockage removed. He had somehow eaten an acorn cap that lodged in his intestine. (We assume he ate a mouse that was using the acorn cap as a beret.) He’s also a diabetic and requires insulin twice a day. Lastly, he had an eye infection and glaucoma, and had to have his eyeball removed. Now he’s a pirate for every Halloween!